Cazenovia, N.Y. (Sept. 16, 2014) – Le Moyne College President Linda LeMura and Cazenovia College President Mark Tierno will formally sign a “4+1 partnership agreement” on Wednesday, Sept. 17 at 3 p.m., at a ceremony that will take place at the Madden School of Business, located in Mitchell Hall at Le Moyne College. 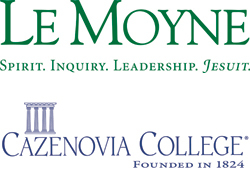 The agreement, a first between the two local colleges, provides Cazenovia students and graduates with a formal path to admission into the Master of Business Administration (MBA) Program at Le Moyne upon satisfactory completion of their baccalaureate programs at Cazenovia. "The MBA Program at Le Moyne prepares students for careers as leaders in an increasingly complex business world, combining the art and science of leadership with a global perspective that stresses ethics and values," said Le Moyne President Linda LeMura. "We are excited about this partnership with Cazenovia College and look forward to being an option for Cazenovia graduates seeking to pursue graduate study in business administration." “Le Moyne’s MBA program will provide Cazenovia students and alumni, who have a specialization in accounting, business management, equine business management, health care management, sport management, or fashion merchandising, an opportunity to earn a quality MBA but more importantly obtain the knowledge and skills needed to develop, implement and evaluate innovative business strategies and to effectively manage people, budgets and projects," said President Mark Tierno. Participation in the articulation program will allow a streamlined application process, with a guarantee of acceptance if certain minimum performance standards are maintained over the course of the undergraduate program at Cazenovia (consistent with Le Moyne’s standard MBA admissions review requirements and entry thresholds). Academic advising will clarify and facilitate Cazenovia student participation in a “Pre-MBA” articulation program, including meeting specific entry requirements and GPA thresholds. Students participating in the Pre-MBA program shall be provided with guidance to complete an accelerated or streamlined application process to be developed between the Career Services Office at Cazenovia and the Madden School of Business at Le Moyne College. This program shall become effective for a period of five years commencing with the 2014-2015 academic year. One of 28 Jesuit colleges and universities in the United States, Le Moyne College is a private, four-year institution enrolling approximately 2,400 full-time undergraduate students in programs of liberal arts, science, business and pre-professional studies, and 800 full- and part-time students in graduate programs in nursing, education, business administration and physician assistant studies. Since its founding in 1946, the College has modeled and strengthened the nearly 500 year-old Jesuit educational tradition. As a diverse learning community, Le Moyne is recognized for its academic excellence and commitment to "cura personalis" – the education of the whole person. Cazenovia College, founded in 1824, is an independent, co-educational, baccalaureate college located near Syracuse, N.Y., offering baccalaureate programs in the liberal arts and professional studies. Embracing student success as its primary mission, the College comprises a diverse yet close-knit residential community that fosters intellectual, social, and ethical growth. Our experiential and co-curricular learning opportunities and dedicated team of faculty and staff provide for an individualized educational experience that balances academic and student life. Cazenovia, named one of "America’s Best Colleges" by U.S. News & World Report, is also a nationally recognized College of Distinction. For more information, visit www.cazenovia.edu.